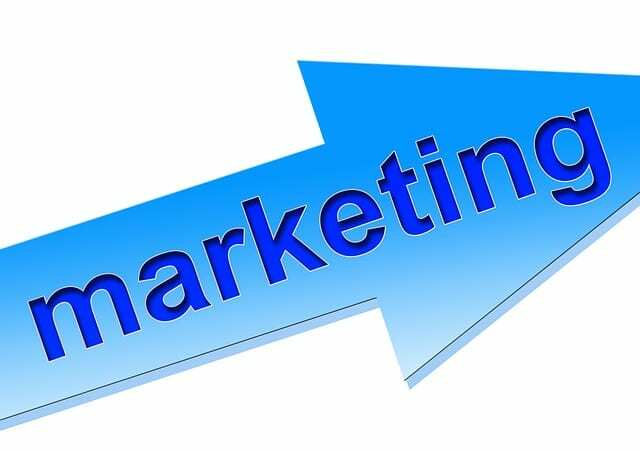 Marketing is the most important aspect of a business, and businesses spend hundreds and thousands of dollars just to make sure their product/service stays in sight of the customers. Putting your message in front of the audience isn’t enough, you need to make sure they also read/watch and engage. To make sure your loyal customers check out your new offers and engage with them, text message marketing is one of the best marketing solutions. Text messages have 100% open rate and 98% read rate, so the investment made in SMS marketing will never be wasted. Furthermore, almost everyone has a cell phone these days, and even if they don’t use the text messaging service, they will still read the text messages they receive. Best of all, customers opt-in for receiving texts from your business by requesting, so this means they are already interested in your product/service. Text message marketing is the best solution for communicating with your existing customers and making sure they are updated with your latest offers. For a good text marketing campaign you also need a good text marketing solution that will take care of all your text marketing needs. 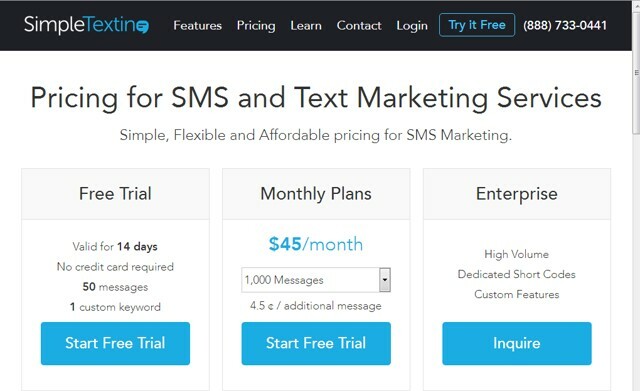 To help you find the best text marketing service that will fulfill all your requirements, we have compiled a list of 10 top cheapest SMS marketing services. Hope you will find the one you need. CheapestTexting is first on our list due to its reliable service and cheapest rates. 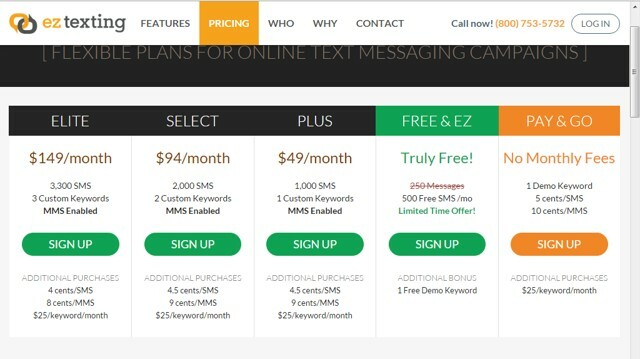 They offer the cheapest rates for sending mass text messages up to 50,000 texts a month. They have total three plans, Free, Plus and Max. Free plan will let you send 100 text message/month with 1 free customizable keyword. This is perfect for beginners starting a text marketing campaign and also to test out the service. 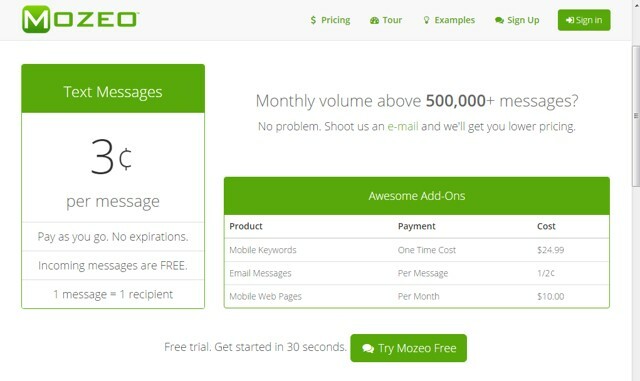 With Plus plan, you can send 5000 messages/month with 2 customizable keywords, just for $49/month. Their Max plan is the best bang for the buck with 50,000 text messages/month and 5 custom keywords (you can run five campaigns! ), just for $99/month. They also have customizable services, including services like customize keyword anytime, capture customer response, import list of subscribers, send Microblog and detailed reports along with full data privacy. If you are looking for a cheap and reliable service, then our recommendation will be CheapestTexting. A very customizable service, Betwext offers cheap rates with no restriction on how much SMS you can send each month. Their most popular plan will cost you $19/month and you will get unlimited keywords, unlimited contacts and unlimited SMS costing 2 cents/SMS. With this structure, you are not bound to any maximum or minimum limitation, you will pay for only what you use. Apart from custom plans, they also have quite reliable features, including dedicated number, import lists, auto-reply, management tools, customizable templates, link shortening and MMS marketing for Gold members. Betwext is one of the best mass texting services when it comes to customizable plans. Like the name suggests, Simple Texting is a simple texting service that doesn’t confuse you with keyword limits or different packages. No matter which SMS bundle you take, you can use unlimited keywords with all of them. Furthermore, there are no custom packages, just choose how much text messages you need and pay the price. Their highest offer is 7,500 messages for a price of $145/month. If you have a bigger need, then you will have to directly contact them to discuss further. Their features include, Import Contacts, Text-2-Win, polling, schedule texts, auto-reply, shorten link, MMS support, Geo-location tracking, track links and complete analysis reports. 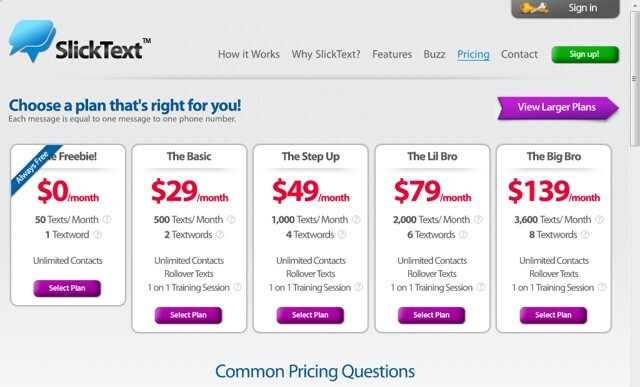 Slick Text offers a simple mass text messaging service that is perfect for beginners. 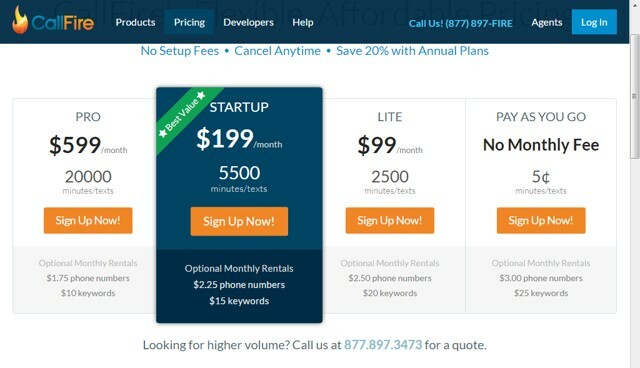 Their most expensive package is of $139/month that offers 3600 texts/month and total 8 custom keywords. Their free plan will just let you send 50 texts/month with 1 custom keyword, so you could just try out the service. Their focus is on ease, so all their features will let you customize and then forget it, rest will be handled by Slick Text. Their services include, Schedule texts, Auto-replies, MMS support, Facebook integration, reuse unused texts, Analysis, Age verification, link shortening and many more. EZ Texting is another good service that might not be the cheapest, but offers some good features. It will cost you $149/month to send 3,300 messages/month along with 3 custom keywords, and if you want more, you can get up to 50,000 messages/month with 15 custom keywords for a price of $2000/month. They also have quite a reliable free plan that will let you send 500 messages/month with 1 custom keyword. They might be a bit expensive, but they also offer some really good features. Their features include, MMS support, simple interface with full control, auto-reply, Reports & Analytics, survey, send SMS up to 160 countries and integrates with other services like MailChimp, EventBrite, AWeber and more. Callfire is actually a call and SMS marketing service that offers both calling and texting service in all its packages. Its best value package costs $199/month and offers 5500 minutes/SMS with each additional keyword costing $15 each. The 5500 number here works as credits, you can use 1 credit to send 1 text or make a call of 1 minute. It has features made for both calling and texting needs, including Text-to-speech support, “Do Not Call” and “Do Not Text” lists, call recording, real-time reports, schedule texts, auto-reply, import contact lists and more. Callfire will only work best for businesses who want to do both call and text marketing as there are no separate packages for each service. ProTexting is a feature rich text message marketing service that offers reliable service for small businesses. Some of its features are, single SMS, Analytics, web forms, Auto-reply, QR-codes, link shortener, virtual business card, MMS support, schedule message, alternative auto-reply and import lists. They also have some side features (costing $10/each), including Email Capture, Zip Code Capture, Name Capture and Text me Button. 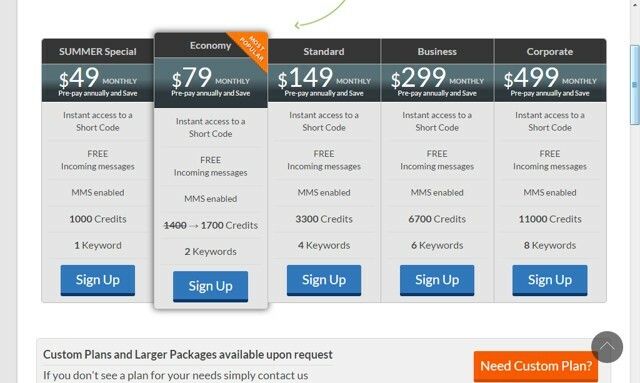 Their standard package costs $149/month and offers 3300 credits along with 4 custom keywords. Each credit can be used to send a SMS or MMS while 1 credit = 1 SMS/MMS. They also have a keyword search bar right on their website to see if the keyword you want is available and also reserve it immediately. This is another very simple and customizable mass text messaging service. It doesn’t imposes any monthly fees or offers limited packages. All you have to do is load credit and start texting people for a price of 3¢/SMS. It will offer all the mass marketing tools, but the pricing is only limited to 3¢/SMS. Although, if you have a bigger need like 50,000+ text per month, then you can also directly contact them to get some discount. Some of its features include, Import contacts, website widget, text conversation, reports, SMS API, and Text-to-Screen. Apart from mass texting service, it also offers email marketing and mobile website if you need. 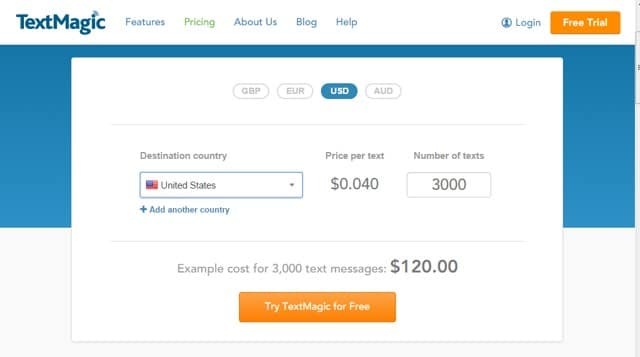 TextMagic is a feature rich text messaging service that offers pay as you go service just like Mozeo. Their pricing is customized according to the location where you want to send the text. For service in the United States, it costs $0.040/text, so you will pay $120 for sending 3000 text messages in the US. The best part is, the credit will never expire, so you will not be bound to spending all your messages each month, perfect for beginners. They also have a comprehensive set of features, including Email to SMS, SMS Gateway API, desktop software, two-way communication and service over 200+ countries. TellMyCell offers both different plans and “Pay as you Go” payment options. For the “Pay as you Go” option, there is no monthly fees and you can send text message for a price of 5¢. 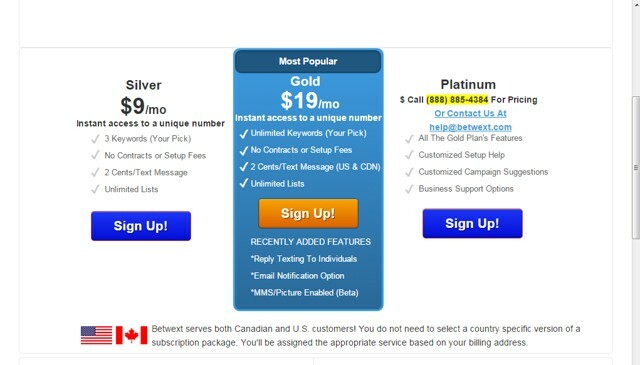 If you want to go for monthly subscription, then their Elite plan will cost you $149/month offering 3,300 messages and 3 keywords. There are three ways to add contacts, from a web widget, keyword opt-in and manually upload contacts list. They also have a very simple process for sending text to thousands of customer by creating groups. Also Read: TRP Guides – How to Send a Text Message from PC ? For your precious business finding the right marketing strategy is crucial, and SMS marketing is of the cheapest and most effective marketing strategy. So spending some capital on text marketing will be quite beneficial for your business. You can checkout our collection of top 10 best mass SMS text messaging services to make the right decision for your business. If you are looking for a really cheap service that offers all the required features by a small business, then CheapestTexting is for you. If you want some side features and don’t mind paying a little for it, then EZ texting and Simple Texting are good services too. Is there any good mass text messaging service that we missed? Let us know in the comments below. Thank you for your research here, it is very helpful. I have been trying to determine what the “best text message marketing company” out there is and why, but it seems that all these review sites give many different opinions and most of them don’t even include the same companies in comparison….so it’s very confusing. I was recently introduced to a company called, “Sentext Solutions” but I cannot seem to find much information about them except for on their own site and on the BBB & Glassdoor. So my question to you is, have you ever heard of them, and if so, what is your opinion/review/suggestions/etc. about this company and the services they provide? Great list. I have used some of them and their platforms are good and well-priced. It is getting hard to find a platform that you can use for the initial sending of an invitational text. I will check these out and see if any meet my needs. Great list and recommendations. Protexting has a great feature for scheduling messages – drip sms. we use it for up selling process, all done on autopilot. Great artickle, however these platforms are by far not the cheapest ones. If you are looking for the best mix of the price and features, I suggest you to try another platform that wasn’t mentioned here, Co-Sender.com. Very reasonable price ($0.02 per SMS worldwide) for bulk SMS sending with personalization, automation and delivery tracking.